Knorr Hollandaise Sauce makes this sophisticated dish unbelievably simple. Fresh lobster, vegetables and a rich sauce is all you need to wow your guests with a flavoursome meal. Boil the lobster for 5 minutes and cool down in ice water. Cut the lobster in half, and remove the stomach and intestine. Open the claws and take the claw meat out. Put the claw meat in a pan with some melted butter to reheat just before serving. Place the lobster halves on a tray. Slice the fennel really fine on a mandolin and let it get crunchy in ice water. Strain and mix with the herbs and micro leaves. Mix the cold Knorr Hollandaise Sauce with whipped cream and season with salt and pepper. Pour gratin mix over the lobster halves and place them under the grill until they are a nice light brown. Heat the clam gently in the butter and put it on top of the lobster. 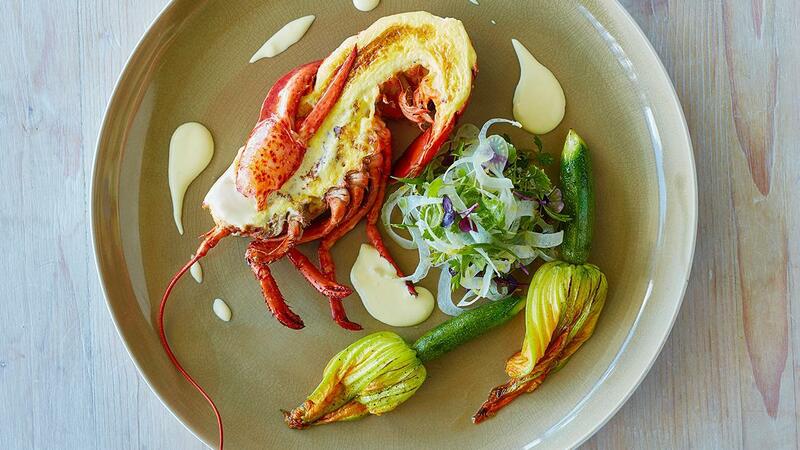 Plate the lobster, fennel salad and the stir fried zucchini flowers. Finish with some extra Hollandaise sauce.